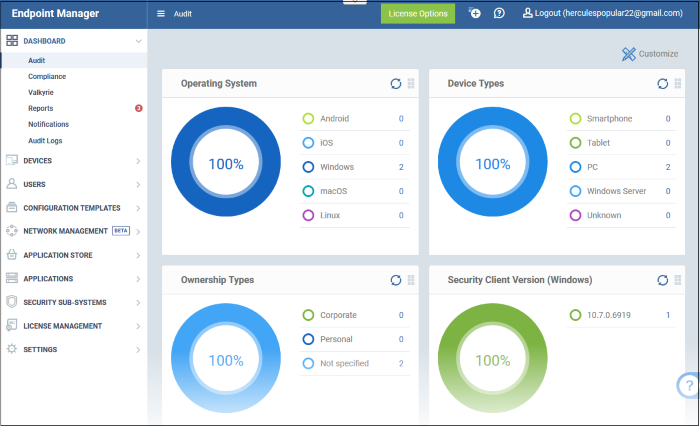 Endpoint Manager (EM) lets you manage, monitor and secure devices which connect to your network. Admins must first add users to EM then enroll devices/endpoints for those users. Supported operating systems include Android, iOS, Mac OS, Windows and Linux. Once a device has been added, admins can apply profiles which determine the device's network access rights, security settings and other features. Each license covers one device per user. You will need additional licenses for each device you add for a user.